Climbing plants and tall perennials need a support structure for their vertical growth. Not all climbing plants are self-clinging, which means they need help ‘attaching’ themselves to these supports. 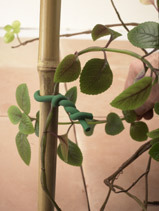 Mark’s Choice flexible plant ties are extremely useful for training plants. They are designed and manufactured in Canada which means they are suitable for our Canadian environment. The supply grip insulating material used to coat the wire remains pliable to minus 50 degrees C. They are reusable for many years and easy to twist. Available in 50′ lengths.